The Atlanta Symphony Orchestra’s season is ending on a very high note with a concert version of Verdi’s “Aida.” This was simply the finest opera performance in Atlanta this season. Prior to Thursday’s concert, it was not obvious why the orchestra would want to perform “Aida.” It’s a work that cries out for a gigantic production on a large stage, with massive sets and an army of supernumeraries. And it was presented here only four years ago by the Atlanta Opera. Their staging was underwhelming due to financial constraints, but their musical performance was a triumph. So why, in a city whose resident opera company is down to three operas a year, must we get the same opera so soon? If this performance did not fully answer that question, it did give Atlanta a sense of what it’s like to experience real world-class opera. Latonia Moore has become the Aida of choice today, and her performance here was electrifying. The voice is simply immense yet capable of the finest pianissimo, grounded in solid technique. Her high notes are lustrous, with an old-fashioned weeping sound. Even in a concert performance, she is riveting to watch. Our Radames, Stuart Neill, lacks the traditional ringing Italian tenor sound, but his is an original voice. He has a darker, almost baritonal timbre in the middle register and the high notes are solid. More important here, he has the massive power to sing opposite Moore. Mezzo Michelle deYoung portrayed Amneris, the Pharaoh’s daughter. Her dark-hued voice filled the room with exquisite sound. Baritone Gordon Hawkins was a noble Amonasro. Turkish bass Burak Bilgili generally held his own as Ramfis. Evan Boyer, as the Pharaoh, has a rich sound hampered by a lack of focus, though this improved over the course of the night. 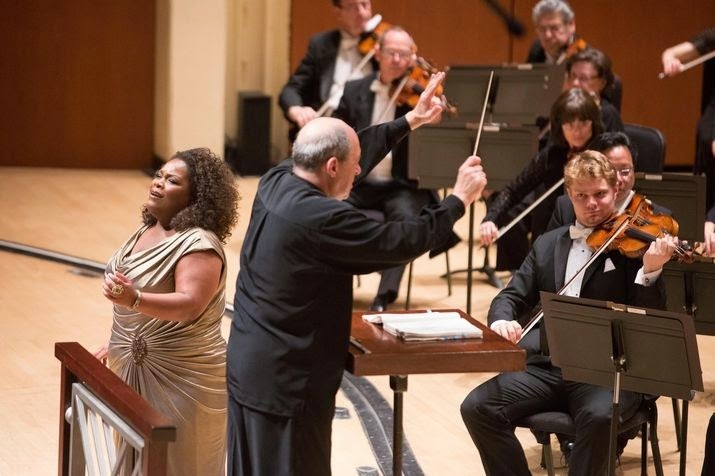 Soprano Kearstin Piper Brown sang the High Priestess role nicely from behind the orchestra. Armed with these gigantic voices, ASO music director Robert Spano unleashed a big, thrilling torrent of sound. And here is where the ASO’s advantages came into play: The orchestra is larger than all but the biggest opera orchestras; its chorus is gigantic, with a sound unmatched by any opera chorus in America; and an orchestra on stage, rather than in a pit, has a bigger and more distinct presence. It all came together, though, because of Spano’s command of the score. Every minute came alive, punctuated by real thunder from outside right at the very moment the priests had prayed for divine intervention. Atlanta is opera-deprived, and one reason is that the ASO in its well-deserved glory has come to take up all the oxygen, leaving the Atlanta Opera, our scrappy little opera outpost, to struggle. The opera company’s budget of about $5 million is dwarfed by the ASO’s budget of $40 million. In Atlanta’s peer cities, these amounts are roughly equal. The result is that we don’t get to hear much opera. Performances like this one serve the purpose of letting Atlanta hear why it’s worth investing in this admittedly costly art form.